Why is it that weight is a constant battle for most women? I know that I'm not alone in this. How often do you wake up and look at yourself in the mirror and think, "I'm rockin'!" Unfortunately, it doesn't happen very frequently here at Pleasant Drive. Like Whitney at The Glamorous Life of a Housewife, I am dieting. Brian and I completed an 11-day diet before we went on vacation to Belize. We were astounded by the results! Brian lost 12lbs in 11 days and I lost 7. 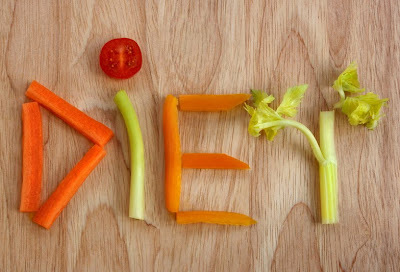 The diet is boring, but easy, because it tells you exactly what to eat. We usually get off track when we say, "Oh, we're going to eat healthier." This isn't specific enough, and it's easy to justify bad food choices. I need rules, people! I'm a teacher. We like rules. So, we successfully completed the 11-day journey, and then we went on vacation. Now, we're not fanatical, so we allowed ourselves to enjoy the unique Belizean food, without any restrictions. By the end of our trip, we were both feeling a little pudgier than when we left, but nonetheless, we fully relished in the foreign food experience. Alas, all good things come to an end. So this week, we're back at home and back on the diet. In the end, I gained 3lbs on the trip, and I think Brian gained 5. So, we didn't regain all of our lost weight, but some. We're on day 3 of the diet today, and so far, I've lost 4lbs in 3 days. That's pretty good, I think. 8 more days and only 2 lbs away from my goal! Diets are no fun! But this one seems to be working well...not that either of you need to be on one! can you please share what is involved in this diet!!? Wow! I haven't decided if I want to weigh during the diet or just wait for the big finale and be amazed all at one time. :) YAY for you! WOW! Way to go! You guys are awesome!!! Now I saw pics of you in a swimsuit on your vacation and I think you look fabulous!! I would love to hear more about this diet! PLEASE email me at cecilycoleman at gmail dot com I need information on this diet! Thanks! It is a great diet. Its going well for me so far. But, out of curiousity where did you get it from? I am so glad you passed it on to us! Thanks! PLease do post what this diet consists of! Yea, I saw pictures of you in your swimsuit too and I really can't see that you need to lose weight. However, a couple more pounds is a good goal since you're doing it. The only way I can get through diets is to allow myself to get off for special events like vacations and birthdays. You know those times when the event is special and the food is part of the specialness. I'm really proud of Brian! I think it's harder for men so I'm glad you're dieting together.